There is no question that Missosology can’t hide its disappointment when Miss Denmark Klaudia Parsberg didn’t make it to the semis of Miss Earth 2016 pageant. In an opinion piece written by Drew Francisco post coronation night, the exclusion of Miss Denmark Klaudia Parsberg was called as a “let down” and described Klaudia as “one of the most prepared and dedicated ladies in the competition”. Time wasn’t on the side of Klaudia Parsberg. She was thrusted into the limelight after the original titleholder relinquished her crown. But in the short span between being crowned as Miss Earth Denmark 2016 and the time she flew to Manila for the competition, Klaudia managed to prepare herself. She studied further and brushed herself with most pressing environmental problems that world is facing today. By the time she competed, we saw a confident Klaudia which completely masked the hectic schedule that she went through. Klaudia also walked the walk. She rolled up her sleeves to pursue her environmental program. In an exclusive interview with Missosology before she set afoot in Manila, Klaudia revealed that she worked with the Technical University of Denmark (Danmarks Tekniske Universitet) to measure the health of lakes in Denmark. She wasn’t involved in environmental projects just because she joined Miss Earth but because it is her passion. 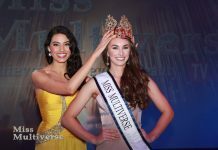 Whatever are the reasons why Miss Earth decided to exclude Klaudia Parsberg from the semi finals, it seems there was a near unanimous dismay among pageant observers. Many fans and missosologists agree that Klaudia should have been one of the semifinalists. If only she were there, she could have proven her worth not only as a beautiful and a shapely woman but as a woman whose passion towards the environment is unflinching.